Shakti is Stree and Stree is Shakti, whether she is an Indian or foreigner , whether she is urban or rural , whether she is literate or not, whether she is a Homemaker or working woman. The shakti , the strength of a woman is inherited in the womb. Women are born creators , inventors and Entrepreneurs. They create, they nurture and they celebrate their unique identity through various avenues. The event commenced with the lamp lighting & inviting all the respective dignitaries- Shri. Vinod Kumar, Shri Haribhai Parthibhai Chaudhary, Shri.Kalraj Mishra and Smt.Arundhati Bhattacharya (Chairman, State Bank Of India) on the Dias by felicitating & acknowledging their achievements. In order to capture the real essence of the day there was distribution of cheques for loan sanction by SBI under Standup India Initiative by the luminaries present at the event. Smt. Ranjana Naik- Founder Swan Suites, Smt. Dipali Sikand- Founder Les Concierges, Smt. Sarita Sarvaria- Founder Express Housekeeper, Dr. Smita Naram- Founder Ayushakti Healthcare, Smt. Nina Lekhi- Founder Baggit, Smt. Patricia Narayan- Founder Sandeepha Group of Hotels, Dr. Sheetal, Dr. Shilpi Dwivedi, Chitra Deshpande, Smt. Rupali were felicitated for their exemplary contribution to their respective fields & shared their success stories & reveled their mantra to success. Smt Arundhati Bhattacharya, Chairman, State Bank of India addressed the guests & media in an encouraging speech "I am overwhelmed to be a part of this event today. It gives me great happiness to help women be independent & achieve success. We have chosen this day to sanction loans to women but having said that, once somebody takes a loan the meter doesn't stop it runs 24 hours. Most of us fear the word loan due to the kind of interest we have to pay but I would like to take this platform to announce that we have many such schemes which will take care of all the hassle & stress people who through. I request everyone to help each other and create awareness about such schemes from which everyone can benefit. My request to you also is that if you have any friends & relatives who are looking forward to built a great future, please let us know & we will try our best to help them. 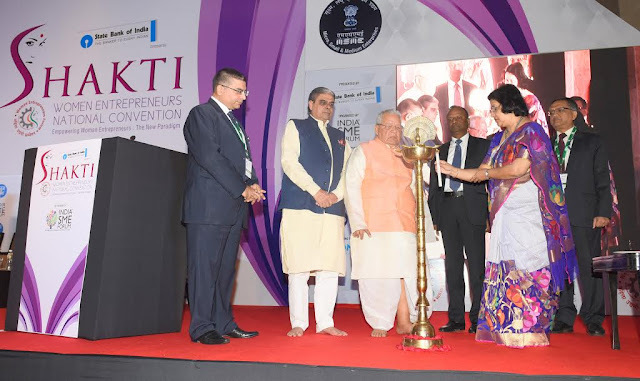 Shri Kalraj Mishra, Honble Union Minister for MSME said "I am privileged and honored to be here.Women are the backbone of our economy and important stakeholders in the destiny of how the Indian economy is going to shape in the future. The day is Internationally known to celebrate womanhood-- their strengths, achievements & their stories. India is a land where we worship Goddess Laxmi, Durga , Aadhi Shakti, Saraswati who have been the source of SHAKTI for us. Women of India will turn our developing country to a developed country in the next couple of years"
"Our Women's Wing invites all Indian Women Entrepreneurs and wishes to empower them, by offering substantial knowledge and national best practices in doing business, access to financing under Mudra & Standup India Initiative, innovation in projects, assessing risks and growth mantras enabling them to setup and run a sustainable business creating a positive direct impact on the economy as well as the entrepreneurial ecosystem, for the generations to come. We wish to wake up the Nation to the infallible spirit of Indian Women & help unlock their true potential " - - Sushma Morthania, Co Founder & DG, India SME Forum. “The Best Thermometer to the Progress of a Nation is its Treatment of its Women.” - Swami Vivekananda! Applauding the spirit of women, their strength and their stories, Women Entrepreneurs Forum - Women's Wing Of The India Sme Forum organized Shakti- Women Entrepreneurs National Conventions 2017. 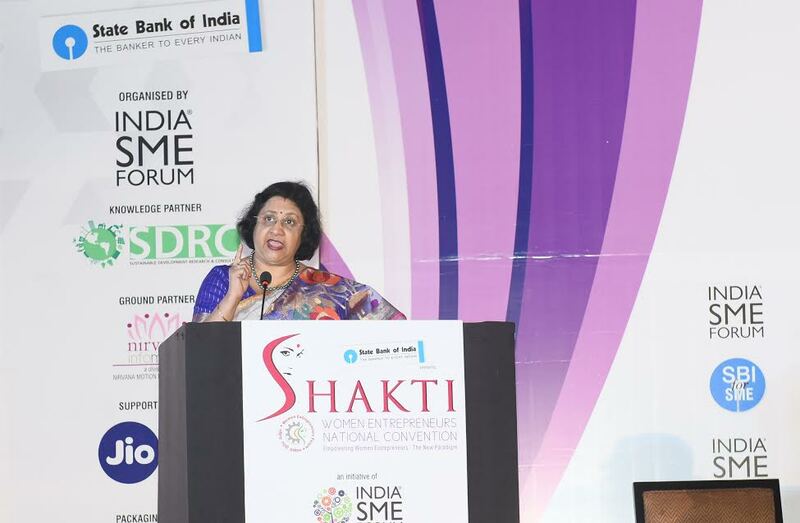 India SME Forum along with the State Bank of India, conducted “SHAKTI” – Women Entrepreneurs National Convention 2017” with the aim of unlocking the true potential of women entrepreneurs of India. In order to encourage the Women across the country, to strengthen their desire to start or nurture entrepreneurship, the Women Entrepreneurs Forum organised a workshop for Empowering Women Entrepreneurs into a New Paradigm & Supporting Women Entrepreneurs for Creating Brands & discussing Opportunities for Women in Business. 9 Most Enterprising Women Entrepreneurs of India were Felicitated and Sanction letters were issuesed to select women Entrepreneurs under the aegis of The Stand-ups India Scheme for Women. The Spotlight session at the convention featured encouraging talks from the Guest Speakers & Award Winning Entrepreneurs, more importantly Successful Women Entrepreneurs who bearded Testimony to the overcoming nature in difficult situations with strong willpower for emerging successful. The workshop invited all the aspiring women startups & existing entrepreneurs to participate and network with fellow aspiring women entrepreneurs apart from mentors, bankers and successful Entrepreneurs. The confirmed speakers at the Workshop include the Chief Guest, Shri Kalraj Mishra, Hon'ble Union Minister Of MSME, Shri Haribhai Parthibhai Chaudhary, Minister of State of MSME, Smt. Arundhati Bhattacharya, Chairman SBI, Shri. Rajnish Kumar, MD -National Banking, State Bank Of India, Shri. Prahlad Kakar, AD Guru & Chairman India SME Forum, Shri. Vinod Kumar, Venture Investor & Hon. 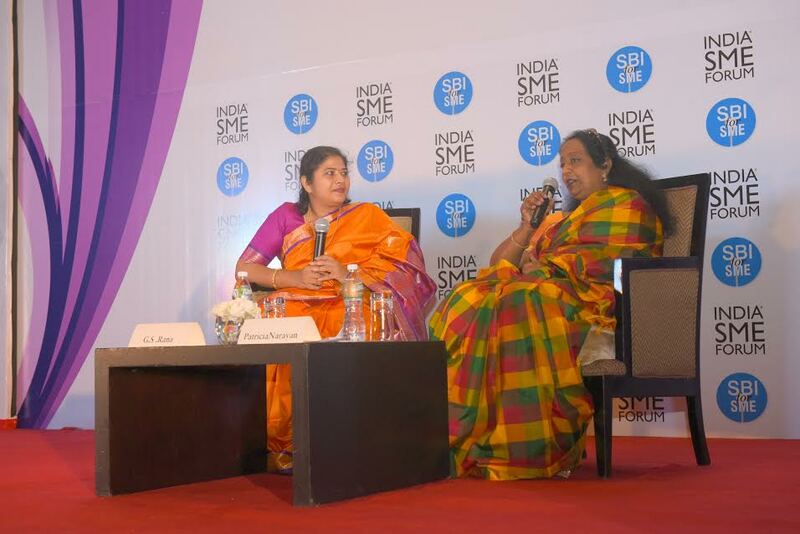 President India SME Forum, Ms. Sushma Morthania, Co Founder & DG India SME Forum and Smt. Uma Shanmukhi Sistla, GM- SME, State Bank of India, Corporate Centre, Mumbai. India SME Forum has realised that women are the core of the Indian Society and they can easily become the base and credible drivers of creating a new social mind set towards entrepreneurship. Women exposed to Entrepreneurship can easily change the social mind set of success, defined today in India by secure and stable jobs. Keeping in view of achieving this objective, India SME Forum started The Women Entrepreneur Wing of ISF which was inaugurated by Smt. Sumitra Mahajan, Hon’ble Speaker of the Lok Sabha in June 2014 and has garnered 7068 women entrepreneurs as full fledged members, from all over India since then. India SME Forum is India's biggest not for profit initiative for Small & Medium Business with the objective to propel the SME movement, by nurturing entrepreneurship and support innovative, globally competitive, SMEs in India. ISF has a membership base of 76,000+ SMEs around India and their initiatives are supported by Union Ministry of MSME. Their Advisory Board comprises of luminaries like Mr.Prahlad Kakkar, reknowned Brand Guru, Mr. T. R. Bajalia,Ex- DMD of SIDBI and ED-IDBI, Dr. J. S. Juneja, Ex-Chairman & CEO of NSIC, Mr.Parag Patki, Ex CEO SMERA, Mr. Ajay Thakur, Head-BSE SME, Mr. Vinod Kumar, Managing Partner, SDRC India Advisors, Mr. Hemendra Mathur - Investor, Former MD SEAF. Today, the India SME Forum has over 200 industrial & commercial associations as supporters and 24 major corporations & organizations as partners including State Bank of India and strive to change the entrepreneurial landscape in India and to create an environment that inspires, supports and celebrates Start-ups, Women entrepreneurs, Small & Medium Business and aids economic growth.